In a building protected by the Superintendency Fine Arts, with a beautiful garden with two gazebos. A true haven of peace and tranquility, 2 minute walk from the beach, with a stunning view of the sea and the hills around. 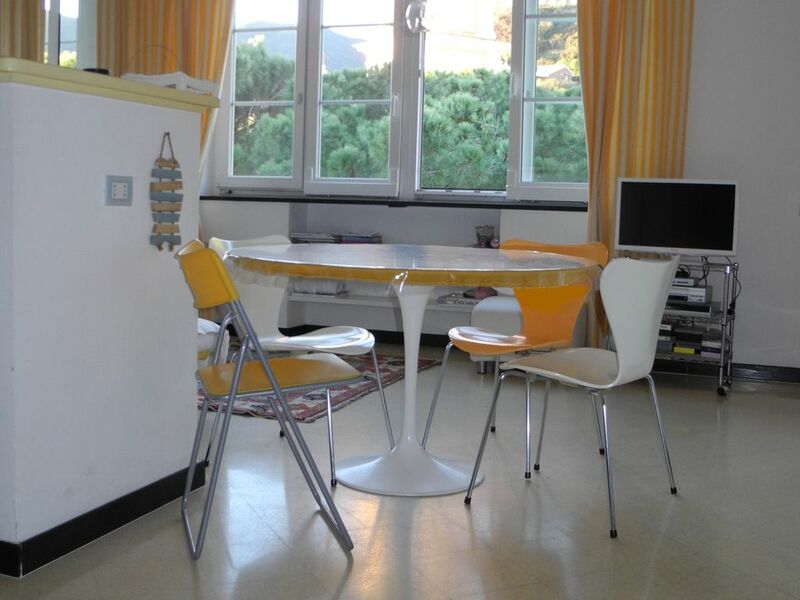 The apartment, located on the 3 'floor, is completely restored and tastefully furnished with many design pieces: Knoll Saarinen round table, Arne Jacobsen chairs, Artemide and Album lamps, Poliform furniture and Varenna kitchen. The apartment has a large living room with open kitchen, fully equipped and with dishwasher, a master bedroom and a double room, two bathrooms and washing machine. There is WIFI and the air conditioning system (although in reality it's never used, because even in summer in the apartment temperature is pleasant). Bed linen is included: need for the beds + a set of towels for each guest. The apartment has a BOX to park the car, fundamental in Moneglia where it's very difficult to park. Moneglia is known for its blue SEA, its SANDY BEACH and the rocky coastline that separates it from Riva Trigoso, dotted with bays and coves, sometimes reachable only by sea. For lovers of SCUBA DIVING, Moneglia offers itineraries of old boats submerged in the waters around. TREKKING and walking enthusiasts have the opportunity to choose from a wide range of naturalistic trails leading into wild and spectacular places, as Punta Baffe and Punta Manara. Not to mention the network of trails, coastal and interior, around the Cinque Terre. La RIVIERA LIGURE DI LEVANTE (area where Moneglia is) is among the most beautiful and fascinating areas in Italy: very beautiful and lovely towns, as Sestri Levante, whose old town is located between two bays, giving the effect of being on an island. The famous village of Portofino, the towns of Santa Margherita, Rapallo and Chiavari are definitely to be seen. - SESTRI LEVANTE - 10 min. - CHIAVARI - 20 min. - RAPALLO - 30 min. - GENOA and the Tuscan city of PISA and LUCCA - approximately one hour. It's possible to reach Moneglia by train or by car. For those arriving by car, the fastest way is to exit the highway A12 (Genoa-Livorno) in Sestri Levante - Riva Trigoso and take the tunnel to Moneglia. Moneglia is the last town in the province of Genoa, in East Liguria. Once in town, the CAR IS NOT LONGER NEEDED! In Moneglia you do everything on foot. The beach is just few minutes away, as is the town center where there are shops, bars, restaurants, banks and the pharmacy. The main street, closed to traffic, that in Liguria is called "carrugio", is parallel to the profile of the coast and it has many useful and typical shops, such as bakers offering tasty "focaccia" or food stores offering local kind of pastas called "trofie" and "panzotti". In restaurants you can enjoy delicious Ligurian specialties, especially fish. During summer evenings there are numerous entertainment initiatives for adults and children. For its CLEAN SEA, since 1990 it has continuously received the "Blue Flag" recognition, an international recognition which is awarded every year in 49 countries, with the support and participation of the two UN agencies: UNEP (United Nations Environment Programme) and UNWTO (World Tourism Organization). Blue Flag is an eco-label awarded to beach towns that meet criteria relating to sustainable management of the sea and the environment. Very nice, safe property, close to beach and nice restaurants. 10 minute walk to train station. Clean. Comfortable beds. Deborah and her husband have been good guests and I highly recommend them. Communication with her was easy and the house was perfect to their departure. I would be very pleased to host them again! Very clean and spacious apartment. Check in and out well organized. Lorella was very reactive before and during the stay. The car park inside the building is appreciable. Sehr gutes Appartement. Sauber, hell, nah zum Strand. Luftige und geräumige Wohnung mit allem Drum und Dran. Gute Ausstattung (Geschirrspüler und Waschmaschine). 2 Badezimmer davon 1 mit Dusche. Kontakt mit Vermieter nur englisch und Italienisch. In 2. Schlafzimmer Etagenbetten( für uns war das nicht negativ). Sonst fehlt am nichts: 2 WC, Waschmaschine, Spülmaschine, Geschirr, Gasherd, Mikrowelle, 2 Fernseher, Fahrplan für die Bahn für die Ausflüge nach Chinque Terra, La Spezia, Genova. Bootfahrt zu Chinque Terra kann man von Levanto unternehmen. Nous avons passé un très bon séjour à Monéglia : l'appartement est très agréable, très propre et confortable (grand lit en 160 cm) et conforme au descriptif et aux photos (avec une petite précision : il y a 2 salles d'eau avec chacune lavabo, WC et bidet mais une seule douche à l'entrée de la salle d'eau du côté de la chambre d'enfant - ce qui néanmoins n'est pas vraiment gênant vu la capacité du logement). Le garage fermé dans le parking souterrain au pied de l'immeuble est bien pratique (certainement essentiel en été). Le village de Moneglia est sympathique, à l'écart de l'agitation des 5 Terres (du moins en avril !) et avec une belle plage (à 3 minutes à pied de l'appartement). Il faut noter que la fréquence des trains vers les 5 Terres est plus faible qu'au départ de Levanto (environ 1 train par heure durant notre séjour) mais là encore il suffit de s'organiser ! (la gare est à 12 minutes à pied de l'appartement).